Wow, talk about being busy! I've had nearly no time to sit down and paint or do anything hobby related since the week before the last big Apoc game as we've been getting stuck into some major home renovations and landscaping upgrades. While this is all well and good it does mean that I've felt bad about neglecting the hobby, and in turn my Blog. I'm hoping to pick up the pace again over the Xmas-New Year's break as i'm not going anywhere or doing anything major, so unless something appears straight out of left field then I should get some more painting and posts completed. 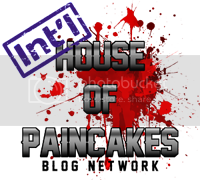 The first was time- i'd glanced at this contest ageeeees ago when the rules and details were first put up online, and in the back of my mind had locked in the 22nd of December as the submission deadline. Lucky I looked at the rules post again, because the submission date was actually the 21st, with the voting starting from the 22nd! So I was trying to complete my entry on the last day for submissions to be accepted!! I wish I could say this was the only time this has happened but I'd be lying through my teeth. However, as history shows this is usually when I'm at my most productive- nothing like a looming deadline to get tasks out of the way!! 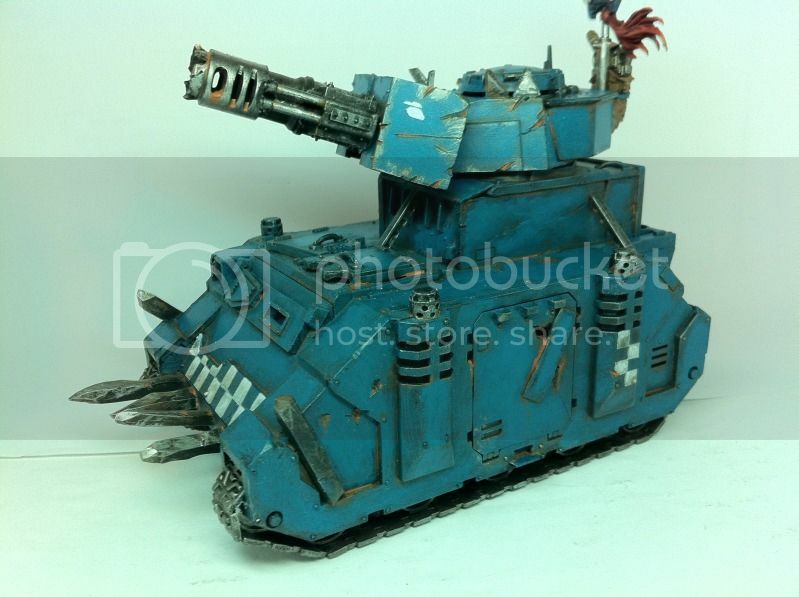 The second issue I had was with choice- in my current Ork army I have 3 Killa Kans, 2 Battlewagons and a Looted Wagon (with Boomgun) as possible HS choices, all of which were done up in their base colouring- Hawk Turquoise blue, Devlan Mud washed, Boltgun Metal drybrushed, with a nice Blazing orange "rust effect", with random white checks and dags. But which of these to do up? Battlewagons- although super cool and imposing, I opted against finishing one of these as there was way too many small details remaining to be painted, and to look good enough to stand a chance of winning I'd have to paint up the crew in their gun cupolas, grabbin claw hatch and the two ladz in the tray manning the big shootas. Im thinking that once both Bwagons are completed i'll be happy to chuck one into the "Transports" competition which comes up early on 2S every year. Killa Kans- I literally had a Kan in hand last night about to apply paint to model when I decided against it- whilst i've used Devlan Mud wash to highlight all the hydraulics of the engines, legs and arms/weapons of these models I feel that i'd regret rushing their paintjobs to make a competition deadline. All in all the Kans are my favourite models in the armym, and this persuaded me to work on them with a bit more care and to take my time. Sorry ladz- i'll get to you soon though! Looted Wagon- so yes, eventually the Wagon got the go-ahead for a quick completion job to make the competition deadline. The blue was touchup up with some more stippling in the middle of the panels to brighten it up and make the paintjob "pop". When doing this I stayed away from panel edges, joins and 'damaged' parts of the tank where the Devlan wash and Blazing Orange "rust" was found. I also gave the tracks and wheels a quick hit of Boltgun Metal (they were still in black undercoat), folowed by a single heavy wash of Devlan. 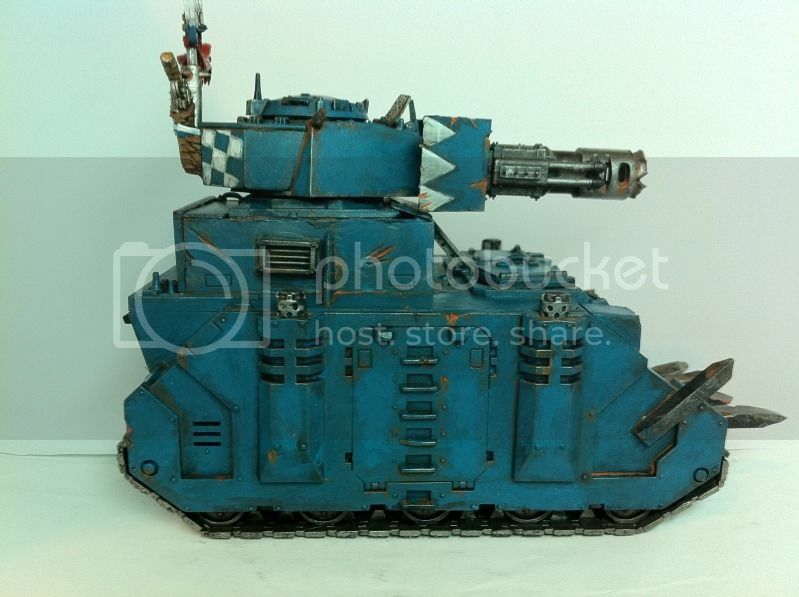 The majority of the time spent was on the twin pistols (with leather holsters), banner pole and icon strapped to the back of the turret- ironically, when I ended up taking the photos and picking out the three to submit you really cant see any of tthe detail or time that went into this work. I also went back and applied a second hit of thinned/semi-wash Blazing Orange to the current rusty parts of the tank where I felt the colour should be more pronounced, with pure dots of the colour applied where large orange bubbles of rust should show through. With all my painting done, it was time to get some photos. Some people like to photograph outside in natural light, but if you're like me then you'll want more control- for this reason I use what is commonly referred to as a 'light box". Put simply, a lightbox is a box (OMG no way!) with a bright colour on some or all of its internal walls to reflect light around the object placed in the middle of the box. My lightbox is a carboard carton originally used to hold reams of A4 printer paper- i've cut one side out so its now two side walls, a back wall and floor, all of which have had white A4 paper glued into place. I've then used a pure white energy saving globe (i've found these to provide excellect illumination with almost no colour distortion) positioned just above the camera that i've used for the photos. As for that Camera? Its simply just my iPhone 4 camera sitting on a small wooden block, with the "HDR" photo setting turned on. All I do is get some focus on the model, move the light source around until i'm happy with what I see and start snapping off shots- sometimes the HDR gives better detail shots, other times it might wash some colour out, so it gives two photo versions to select from. Anyhow, less talk more pics- here's the comp entry photos that I ran with. 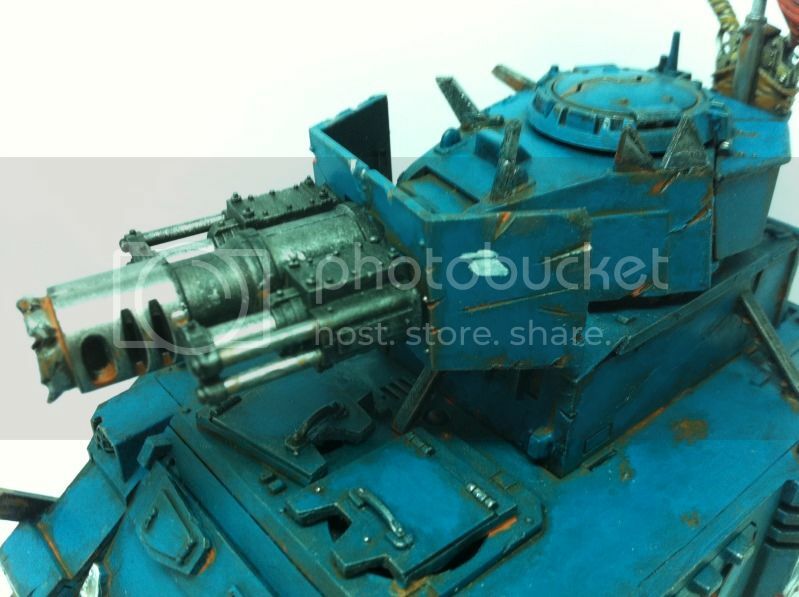 You may note that I painted a small 'kill marking' on the turret, as the Looted Wagon has so far been able to destroy a Leman Russ Battletank (a few months back at ANUCON), I thought it only fitting that the crew would mark this somewhere. Its not exactly Orky in how it looks but I reckon it looks cool! I love how the triangular dags on the turret blastshielding look three-dimensional, even though its just painted on. A closeup of the turret, showing the Killa Kan "pogo" legs that I used as recoil suppressors. The competition entry thread will be up a day or two's time (competition committee are generally all UK-Europe based), so make sure to have a look and cast a vote if something takes your fancy!